Throughout The Force Awakens, the specter of the First Order looms over the heroes, and few figures are more emblematic of this terrifying force than Kylo Ren. Though he’s young, Kylo Ren is strong with the Force, drawing upon the legacy of his grandfather, Darth Vader. And with the Kylo Ren Starter Set for Star Wars™: Destiny, you’ll find an ideal place to start playing the game and pledge your loyalty to the First Order and the dark side. 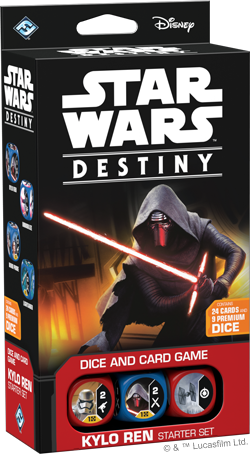 Star Wars: Destiny is a collectible dice and card game that invites you to stage any battle you can imagine between the most iconic and infamous characters from the entire Star Wars saga. 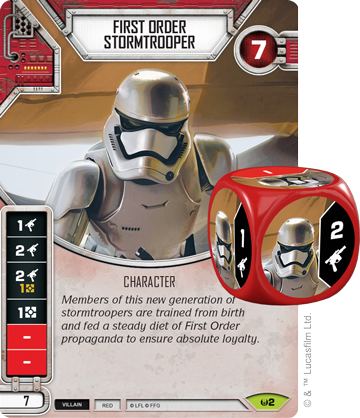 Your first contact with the game of Star Wars: Destiny is through a starter set, and then, if you wish to expand your collection with new characters and tactics, you’ll find new cards and dice in a variety of booster packs. Today, we’ll take a closer look at one of your entry points to the game of Star Wars: Destiny—the Kylo Ren Starter Set. Within a starter set, you’ll find nine premium dice and twenty-four cards—everything you need for one player to start playing Star Wars: Destiny. Before you begin crushing the Resistance though, let’s take a closer look at the Kylo Ren Starter Set and all the dice, cards, and strategies that you’ll find inside. The heroes or villains that you choose for your team will undoubtedly form the heart of your strategy, and the characters included in the Kylo Ren Starter Set are no different. First, you’ll find Kylo Ren (Awakenings, 11) himself—a vicious warrior whose uncontrollable anger manifests through the ability to inflict random amounts of damage on enemy characters. 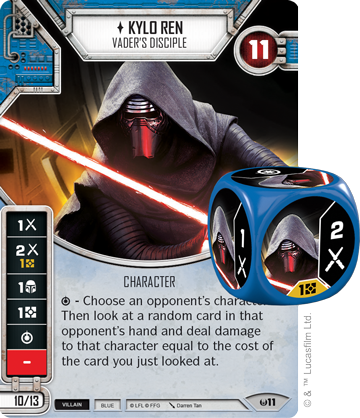 Although Kylo Ren’s dice do feature some melee damage, he can potentially deal even more damage with his special ability, which allows you to look at a random card in your opponent’s hand and deal damage to a character equal to the cost of the chosen card. 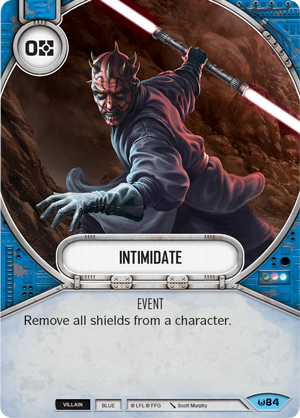 Obviously, this could result in no damage if you reveal a card that costs zero resources, but revealing a card like Lightsaber (Awakenings, 59) could be enough to finish off a weakened opponent. Kylo Ren is joined on the field of battle in this starter set by a First Order Stormtrooper (Awakenings, 2). This non-unique character boasts no special abilities, but it does provide you with a relatively consistent source of ranged damage. It also gives you a body that you can sacrifice to protect Kylo Ren—but we’ll look at that more below! Just like in The Force Awakens, Kylo Ren’s fits of rage—and the results—can be impossible to predict. In a fitting piece of theme emerging in gameplay, you’ll find plenty of other cards within this deck that you cannot entirely predict. For instance, you may equip Kylo Ren or the First Order Stormtrooper with a F-11D Rifle (Awakenings, 8). 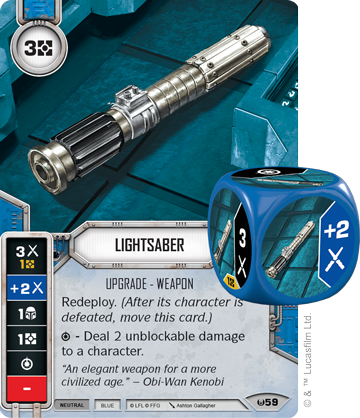 This upgrade adds another die that can significantly boost your ranged damage, while its special ability reads, “Force an opponent to deal 2 damage to their characters, distributing the damage as they wish.” Although you can force the damage to be dealt, you can’t say with certainty where it ends up. 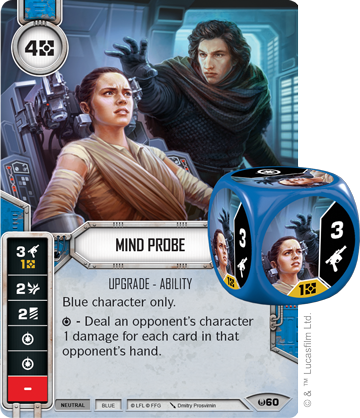 Similarly, you may attach Mind Probe (Awakenings, 60) to Kylo Ren. This powerful upgrade can deal ranged damage or target your opponent’s resources and cards, but the special ability on Mind Probe ranks among the most impressively dangerous effects in the game. By triggering this special ability, you can deal an opponent’s character one damage for each card in that opponent’s hand—potentially up to five damage if your opponent isn’t able to play out some cards before you break through any mental defenses. You may even choose to completely randomize the playing field by playing Disturbance in the Force (Awakenings, 146). This event has a simple effect—only three words—but the ramifications can turn a game completely upside-down. 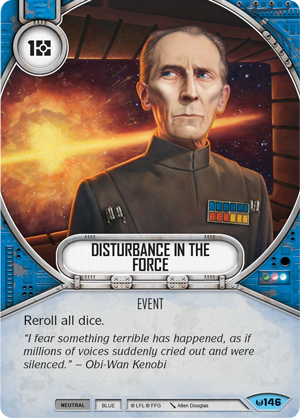 When you play Disturbance in the Force, you immediately reroll all dice in both players’ dice pools, shattering any plans your opponent might have had. And of course, there’s nothing stopping you from playing this event while all of your dice are still safely on your characters, protecting you from any ill effects! Still, there have to be ways to mitigate Kylo Ren’s wrath, and you’ll find ways to manipulate your own dice as you look deeper into the Power of the Dark Side (Awakenings, 89). When you play this support, you gain a measure of control over the randomness of the dice, while still opening a chance to deal more damage. By exhausting Power of the Dark Side, you can immediately reroll one of your dice, hoping to gain a more beneficial result. Even if you fail and roll a blank, however, you can immediately deal two unblockable damage to any character, smashing right through your opponent’s shields. As you’re battling your opponent’s characters, you’ll be trading attacks and damage back and forth. 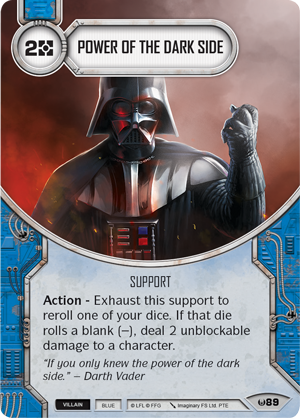 In most cases, it might seem like damaging your own characters would be a risky proposition, but with a few of the cards from the Kylo Ren Starter Set, you might find that gaining this effect at the ideal moment is worth the risk. 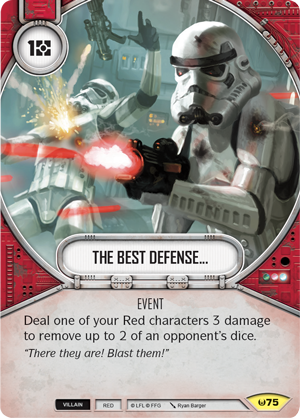 The Best Defense… (Awakenings, 75), for example, allows you to deal one of your Red characters three damage in order to remove up to two of your opponent’s dice. Obviously, you’d only want to do this if those dice represent more than three damage, but there are plenty of situations in the game where this might be the case. What’s more, as a relatively nondescript character, the First Order Stormtrooper is purpose built for taking damage in this way. 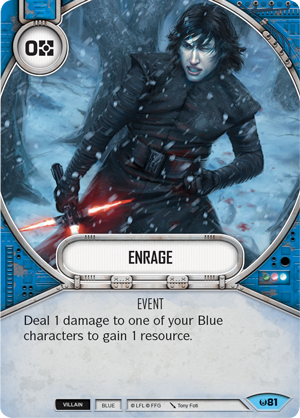 Or, you might choose to damage Kylo Ren by playing Enrage (Awakenings, 81). Just as Kylo Ren repeatedly strikes his own wound in The Force Awakens to fuel his anger and maintain his focus, you can take a little damage in order to gain greater rewards. Enrage offers you a simple trade: one damage for one resource. Still, that one resource could be the difference between whether or not you can pay for a high-cost upgrade like Mind Probe. If you’re going to be damaging your characters to gain other benefits, you’ll need to make sure your opponent doesn’t outrace you on the path to victory. You need the damage that you inflict to be as deadly as possible, so you have to make sure your opponent isn’t just absorbing it all with shields. Fortunately, you have plenty of ways to clear the way before you make your attacks. You may play Intimidate (Awakenings, 84), which reads, “Remove all shields from a character.” Better yet, this event is free to play, making it easy for you to expose a weakness for an incoming attack. 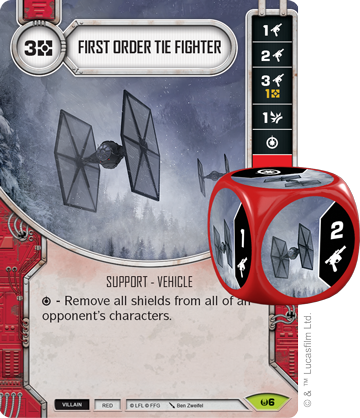 Alternatively, if your opponent has more than one character loaded up with shields, you could deploy a First Order TIE Fighter (Awakenings, 6). This terrifyingly fast starfighter is well equipped for strafing runs, and if you trigger its special ability, you’ll remove all shields from all of your opponent’s characters, leaving him wide open for your attacks and other sources of damage. Ultimately, your goal is to defeat the enemy team, and whether you’re stripping their shields or dealing damage in a fit of rage, you’ll be well equipped with the Kylo Ren Starter Set to destroy your foes. 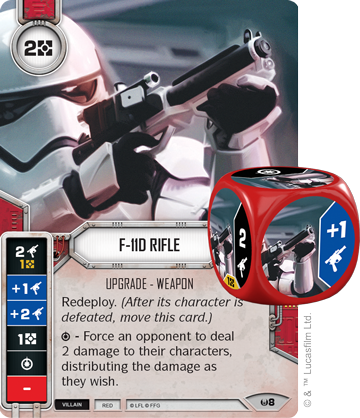 Intimidate removes two shields from Rey, preparing you to launch an attack on your next turn! 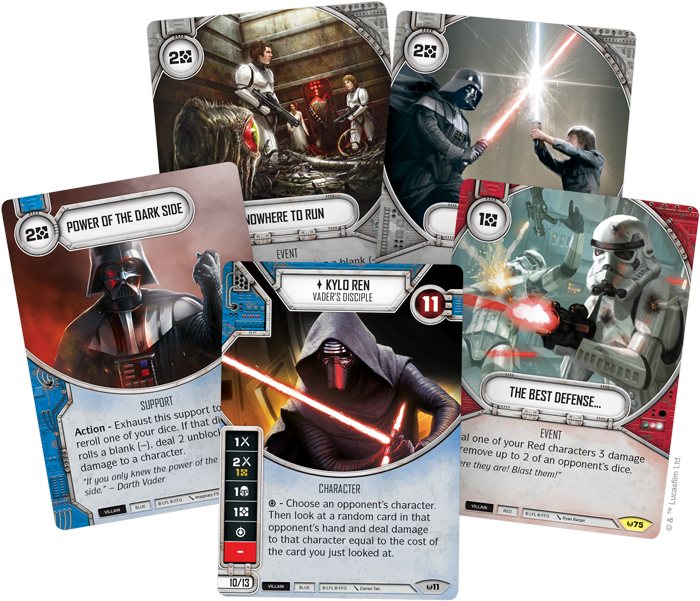 Kylo Ren and the First Order are powerful, but they’re only half of the starter sets for Star Wars: Destiny. Join us next week as we preview the Rey Starter Set, and pre-order your starter sets at your local retailer today! 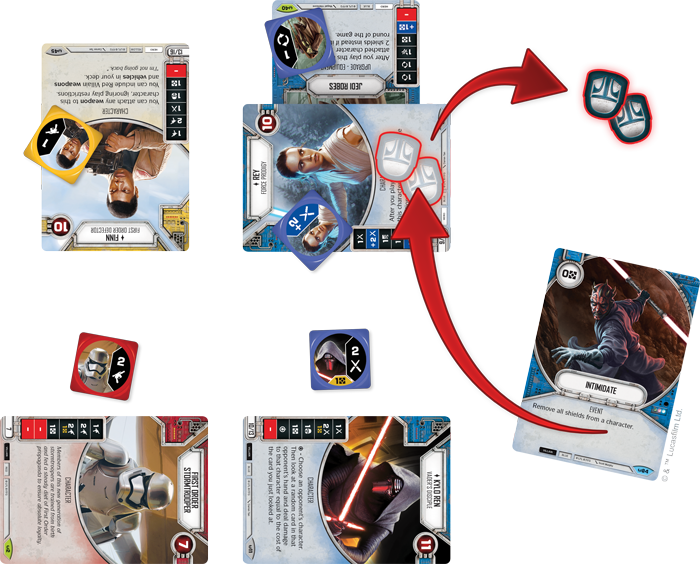 You can also join the Star Wars: Destiny discussion in our community forums.